Apple macOS 10.11 El Capitan which comes with many more surprises. After we have discussed the advantages disadvantages of iOS 9 over iOS 8 and Apple El Capitan pros and cons vs Windows 10, we feel it is time to have an in-depth review on macOS 10.11.4. 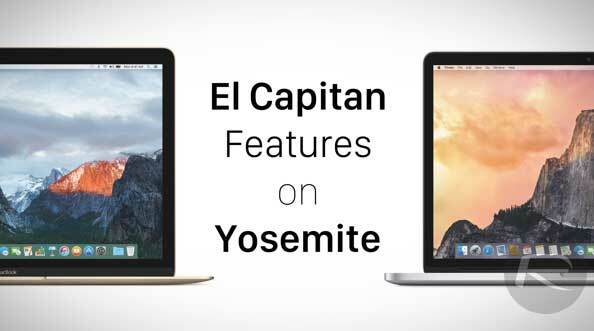 With media opinions hitting the web, here we summarize the top advantages disadvantages, problems and benefits of El Captain compared with Yosemite. Forget iTunes and iCloud. MacX MediaTrans can transfer &　backup videos, music and photos, including 4K UHD video movies photos, between iPhone iPad iPod and Mac El Capitan or later with world's fastest speed without iTunes hassle. When users update from Yosemite to El Capitan, they will enjoy the main new features, improvements and benefits below. Check the benefits of El Capitan 10.11.4 that Apple just brought, like the abilty to share Live Photos between iOS and macOS via Messages and AirDrop. Besides other minior new features, users can enjoy a slew of El Capitan 10.11.4 advantages with the improved stability, compatibility, and security. Performance improvements is a key part in El Capitan advantages and also a good reason for users to go Yosemite update to OS X 10.11.4. Indeed, after users update Yosemite to El Capitan, users can see a number of general performance improvements. According to Apple, El Capitan is faster and more responsive, offering twice faster performance than Yosemite to switch apps and 4 times as fast as in Yosemite to open PDF. Besides, if users update 10.10 to 10.11, they can enjoy extra advantages of in enhanced international language support. Unlike that in Yosemite, now users can re-size and move Spotlight window around the screen since Spotlight becomes even smarter and more flexible. But the key benefits of macOS 10.11.4 lie in its ability to allow users to write queries in natural language. This means that users can track down mail messages and documents easily without entering any complicated Boolean operators. This is among the most welcome advantages of El Capitan macOS 10.11.4 after Yosemite update. Besides, new Transit directions in Apple Maps, weather, videos, stocks, other information are all available in Spotlight. Safari gains in mainly two aspects. First, the new Safari allows users to quickly identify which site is playing sound and mute audio. Second, Safari gains a new option to 'Pin' favorite sites to the left corner of the screen. Also it supports sending video to an Apple TV over AirPlay and users can download videos in Safari from YouTube and more to the larger screen. Among the various advantages of macOS 10.11, there Mail joins. Unlike Yosemite, El Capitan makes it easy to swap over, send and receive messages when composing mail in full screen, offering much convenience to copy text from another mail. And it can also aid you to update your contact, right from your inbox. Maps in macOS 10.11 has received one big update to include the public transportation information. This is also among the top advantages as users now can view bus, train and subway routes in Apple Maps, making the trip much easier after Yosemite update to El Capitan. El Capitan advantages in photos mainly refers to the third-party editing ability added in Photos for Mac. There are professional Apple editors for Mac like iMovie or Final Cut Pro, but it's much easier to make edits to images without actually leaving the Photos app. OS X users have been using Mission Control to have a quick view of and easily switch between all their open apps. macOS 10.11 comes with an improved Mission Control. Now all windows are separated rather than overlapping on the desktop like that in Yosemite. One of the most exciting benefits of macOS 10.11.4 El Capitan for Mac users is the new Split View mode. Yosemite also allow users to place two windows, but after they get Yosemite update to El Capitan, they won't need to size them manually because they can run two full screen apps side-by-side. The extra macOS 10.11 advantages are really time-saving as users can scroll through content on one side while writing on the other side. One of the biggest visual advantages of macOS 10.11.4 is the new system font. Like iOS 9, a new font which was originally designed for Apple Watch named San Francisco is accompanied. Also Chinese or Japanese character-based languages are added in the macOS 10.11.4. After we have discussed the advantages of macOS 10.11 El Capitan, you may get interested in this latest Apple operating system. 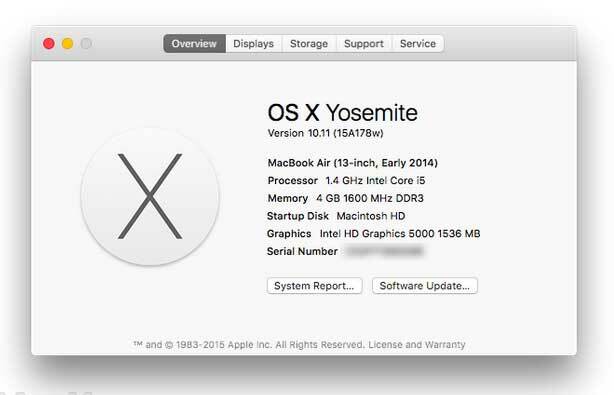 But before you go Yosemite update to macOS 10.11.4 and El Capitan download, you're suggested to check out the top macOS 10.11 disadvantages and problems below. Most of these disadvantages of El Capitan are minor bugs, but they may be of your concern. Note that the latest macOS v10.11.4 has fixed various of drawbacks, like the issue that could cause a black screen after logging in as the root user etc. It's now available for free download and upgrade. Mistakenly displays Yosemite in macOS 10.11.4. Safari crashes frequently for certain page elements like colored horizontal level. It shutdown when users restart the Mac (fixed: enter sudo shutdown -r now to restart). Part text is missing when showing web pages in Safari sometimes. Mac gets hot and drain battery. (reference: tips to improve iOS 8/9 battery). El Capitan problems also include compatibility with Word 2016. Proxy settings is not supported in Safari and all the pages may fail to open if global is set. Safari fails to save cookie for some websites. It goes wrong when dragging windows of some apps. Virtual machine may fail to detect usb devices. Though there are indeed many small macOS 10.11 problems according to the early feedback from users, those macOS 10.11 disadvantages have no significant effect on users' experience and can be fixed easily. Overall, the advantages of macOS 10.11.4 far outweigh its disadvantages and lay good reason to update Yosemite to El Capitan. Note: After the above discussion on El Capitan advantages disadvantage & problems, you may have a tough idea of whether or not to update macOS. Any Mac that runs Yosemite will support El Capitan.